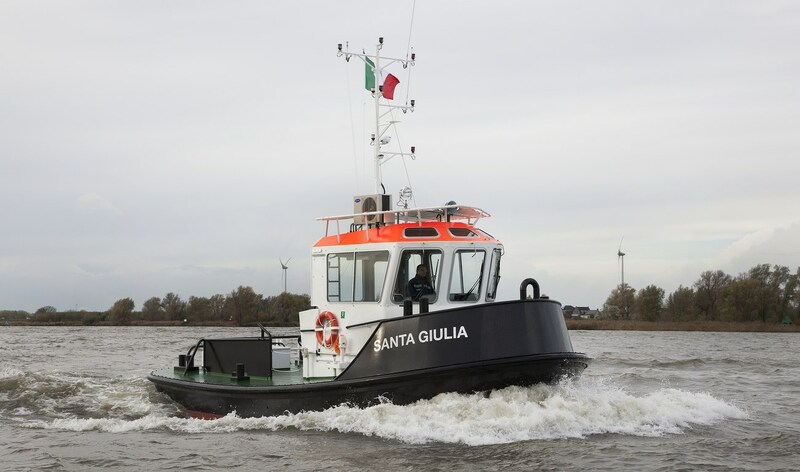 Stan Launch 1305 "Santa Giulia"
Home › Harbour Tug › Pushy Cat › Pushy Cat 1305 › Stan Launch 1305 "Santa Giulia"
Italian towing company Fratelli Neri S.p.A. has expanded its fleet with the delivery of three new Damen workboats. The trio of vessels will be based in the company’s home port of Livorno, on the Tuscan coast. Damen delivered all the vessels from stock; completing the final outfitting works within a timescale of three and a half months. The Stan Launch 1305 was delivered to Labromare S.r.l. ; one of Fratelli Neri’s subsidiary companies. Labromare, which is 50% owned by Tripmare S.p.A., offers waste management and anti-pollution services to ports. The vessel, called Santa Giulia, will perform a range of environmental services in the region.